(Nanowerk Spotlight) Physicists have uncovered a new method to manipulate light by borrowing an idea from the field of mathematical topology – topology is the mathematical field dealing with the properties of objects undergoing deformations, such as stretching and twisting. They created an artificial material, a "metamaterial", that can transform from regular dielectric – a substance like glass or plastic, which does not conduct electricity – to a medium that behaves like metal (reflects) in one direction and like dielectric (transmits) in the other. Metamaterials are engineered composite materials that gain their properties from their structure rather than directly from their composition. A team of scientists, led by Vinod Menon from the Department of Physics, Queens College, City University of New York (CUNY), has now described a way to manipulate the propagation of light within a metamaterial, thereby opening the door to more efficient solar cells, ultra-high sensitive sensors and single photon sources necessary for quantum communication protocols and quantum computers. Through engineering of transmission properties of these systems, and by combining them with light emitters, one may also realize super bright LEDs that would be useful for display applications. "The ellipsoid and hyperboloid belong to different classes of surfaces, the former being closed (bound) and the latter being open (unbound). The main idea here is the manipulation of the dielectric constants of the material along different directions in the structure that creates the unusual dispersion (hyperbolic) which in turn results in huge increase in the optical field inside the material," Menon explains to Nanowerk. "Optical properties of this metamaterial can be mapped onto a topological transformation of an ellipsoid into a hyperboloid (see animation below). The topological transition from such a bound (elliptic) to an unbound (hyperbolic) surface manifests itself in the real world as a dramatic increase of light intensity inside the material." As the team describe in an article in a recent edition of Science ("Topological Transitions in Metamaterials"), this optical topological transition can be exploited to manipulate the propagation of light and control its interaction with the material. To experimentally observe the signature of the predicted optical topological transition manifested through enhancement in spontaneous emission rate, the researchers investigated a metamaterial structure with multiple quantum dot emitters positioned on its top surface. 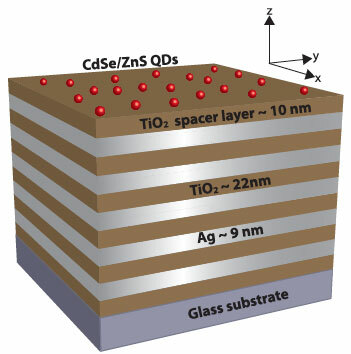 As they detail in their paper, they were able to demonstrated modification in the light emission of these quantum dots. The experimental part of the work was led by Queens College of CUNY in collaboration with City College of CUNY and the theoretical work was carried out at Purdue and Alberta. The work was funded by the Army Research Office, US National Science Foundation - Division of Materials Research, CUNY, and the Natural Sciences and Engineering Research Council of Canada. Part of the experimental work was carried out at the Center for Functional Nanomaterials at Brookhaven National Laboratories. Menon notes that a theoretical prediction of huge increases in the light intensity in anisotropic metamaterials already has been made over three years ago. "The motivation for this work, from my standpoint, was the potential to realize broadband control of spontaneous emission," he says. "Unlike cavities and other similar systems that rely on resonance and hence are bandwidth limited, the anisotropic metamaterial approach provides enhancement in spontaneous emission over a wide bandwidth. One could apply this in reverse to realize broadband absorbers as well." The research team expects optical topological transition to be the basis for a number of applications of both fundamental and technological importance through use of metamaterial-based control of light-matter interaction. As a next step, they will attempt to realize such structures using other materials where the optical losses are lower.